Born in Birmingham, Jones took a degree in mathematics at Birmingham University (BSc 1913) and then studied for Anglican Orders at Litchfield Theological College. After ordination in 1916 he began his clerical career in Birmingham with curacies at St. Paul’s, Balsall Heath then St. Agatha, Sparkbrook. He was Vicar of All Saints’ Small Heath from 1923 to 1928, when he became Organising Secretary for the Midlands Area of the Society for the Propagation of the Gospel. From 1934 to 1936 he was Rector of St. Martin with Whittington Chapel, Worcester, and then Secretary of the Archbishop’s Evangelistic Committee from 1936 to 1938. 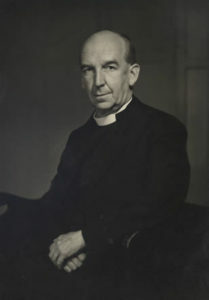 He was appointed Provost of Leicester in 1938 and was prominent in both Church and City life for the next sixteen years. At the outbreak of World War II in 1939 Provost Jones joined the Leicester Fire Service as Operations Officer and Chaplain, and was also involved in issues relating to the War more widely on behalf of the Church, including arrangements for the recruitment and supervision of chaplains to the Armed Services, (1940–42), the “Nails Movement” for promoting evangelism in the RAF (1943-44), and he was the Archbishop’s Visitor to the RAF from 1943-45. He became President of the Rotary Club of Leicester quite soon after his arrival in Leicester in 1941-42 and President of the Lit. and Phil., which he had joined on his arrival in Leicester in 1938, seven years later. In 1954 Jones left Leicester to become Dean of the Manchester, retiring as Dean Emeritus in 1963. Sources: Jones, Very Rev. Herbert Arthur Who was Who 1920 – 2008 (Online edition: Oxford University Press); Obituary: Very Rev. H.A. Jones Dean Emeritus of Manchester The Times Feb. 19, 1969, p. 10. Archives: Correspondence in the papers of Archbishop William Temple, Lambeth Palace Library.